I’ve recently learned of yet another baby dying during a home birth. This was a planned, midwife-attended home VBAC (also known as HBAC, home birth after cesarean). The mother hired Joni Stone CPM and Gengi Proteau (a lay midwife), both of Circle of Life Midwifery. The mother was 41 weeks, 4 days along in her pregnancy. When heart tones were lost during labor, they transferred to the hospital but it was too late... ultrasound confirmed the baby had died. The mother had another cesarean section to birth the baby. Even though the mother was not experiencing any other pain (other than contractions), uterine rupture was discovered as the cause of death. On their website, the midwives assure potential clients "There is a time and a place for medical interventions. If we see a possible complication arising, we discuss the findings, and make a decision to transfer care. We are well trained and equipped to handle such situations." How were they equipped to handle a uterine rupture? They weren't. The only way to handle uterine rupture is to wheel the mother immediately into an operating room. They were right in one thing, though. There is a time and place for medical intervention. It starts with using continuous electronic fetal monitoring for all VBAC attempts, as recommended by ACOG, American Academy of Family Physicians, SOGC (Society of Obstetricians and Gynaecologists of Canada), RCOG (Royal College of Obstetricians and Gynaecologists) and many other professional organizations and care providers around the world -- which is not available at a home birth. What can be done if a mother’s uterus ruptures at home? Transfer time is simply too much time lost and on top of that, the hospital must assess the situation upon arrival. "Delivery of the fetus within 10-37 minutes of uterine rupture is necessary to prevent serious fetal morbidity and mortality." -Nahum GG, et al. The studies that assessed time from uterine rupture to delivery used fetal bradycardias as the sign of uterine rupture. Other studies (1) have shown that even when cesarean sections take place under 18 minutes after prolonged decelerations have been identified, serious neonatal morbidity occurred, such as HIE. If you've ever been a part of a home birth transfer (I have), then you know that having a cesarean section in under 18 minutes is incredibly unlikely. According to a recent study (2) which looked at planned, midwife-attended home births in the USA during the years 2010-2012, 4.4% of planned, midwife-attended home births in the USA were VBAC attempts. Out of 56,140 planned home births, there were 2463 VBAC attempts. 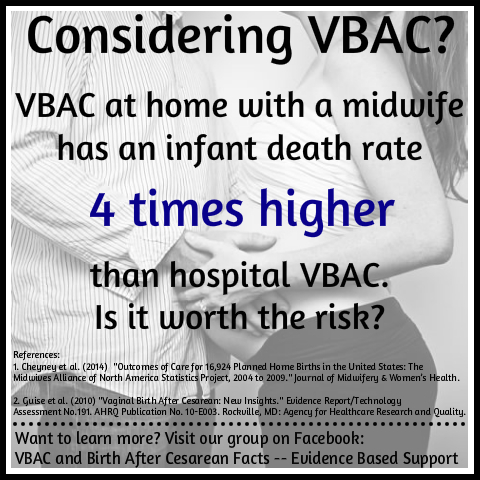 Using the mortality rate for VBAC attempts of 4.75/1000 at home (3), we know that out of those 2463 attempted home VBACs, approximately 12 babies died. Compare that to the mortality rate for hospital VBAC attempts (4) of 1.30/1000, had all 2463 VBAC attempts taken place in a hospital, then only approximately 3 babies would have died. In other words, 9 babies died preventable deaths because the VBACs were attempted at home instead of in a hospital. In the Netherlands, if a woman has had a previous cesarean section, she is risked out of being able to have a home birth. Her care must be under an obstetrician for a hospital birth, either VBAC attempt or repeat cesarean. In the USA, we have no guidelines for home births. Want a home VBAC? It won’t be hard for you to find a home birth midwife willing to take your money for it. Go to any of the popular VBAC websites or Facebook pages and you will find a cheerleading squad of pro-home VBAC nonsense, many of them run by women who have had home VBACs themselves. Risks and mortality rates are rarely discussed (in fact, trying to discuss those things can get you banned pretty quickly) and certainly not without a bunch of charlatans trying to explain away the horrendous mortality rate of 4.75/1000 for attempted VBACs at home. Another death due to uterine rupture at a home birth. Heartbreaking. It makes me so sad. And it makes me angry. It makes me angry that there are VBAC bans. It makes me angry that there are women who have the option to choose hospital VBAC but instead choose home VBAC because they have been convinced that it’s a reasonably safe option – even though it is not. It makes me angry that there are people who promote home VBAC without being completely forthcoming of the risks involved – many of these people are outwardly huge advocates of informed consent for childbirth yet it is far from what they actually support. “Informed consent” means nothing to them when the facts don’t support their own agenda.